Rahul Gandhi’s self-discovery as a practising Hindu and an “uchch koti” (upper tier) Brahmin has confounded his ideological adversaries and outraged his likely friends. He’s got tough love from both. We are arguing here that he has made a most audacious and smart political move at this juncture. The BJP is so irritated, it first wanted to know his gotra as evidence of his claim of being a janeu-dhari (sacred thread-wearing) Brahmin. It unsettled them even more when the gotra was disclosed. They’ve now fielded their Science and Technology minister to raise profound “technical” points on how Brahmin gotra travels down the generations. See what political chutzpah by the top leader of the Congress, India’s largest claimant of the secular space, has achieved. Until not long ago, the debate was on whether Rahul is a Hindu at all or a closet Christian. Then, it moved to whether he is a Brahmin. Now it is about whether he can claim to be a Kashmiri Kaul Brahmin from Dattatreya gotra. Since religion, caste and gotra has now been made so central to national politics, this is progress. A move up the value chain. Definitely for Rahul and his party. We don’t know yet if Rahul did this to a plan, or is it just that he went to a couple of temples during the Gujarat elections and then the law of unintended consequences took over. If you are a Rahul/Congress supporter, you can use that expression “political masterstroke” usually copyrighted by Modi-Shah supporters. If you are from the BJP, you might say he’s recklessly walking into an unprotected political place. He will not get the Hindu vote and lose the secular, particularly the Muslim vote. As they’d put it in heartland Hindi: duvidha mein dono gaye, maya milee na Ram (I lost both in my confusion: Worldly pleasures and God). I’d prefer a different description. But a little later. Rahul has the Left-secular-liberal commentariat in a tizzy. They see it as a betrayal of everything the Congress stood for, a fundamental rewriting of its ideology and a final goodbye to India’s syncretic tradition. The latest, and a particularly well-argued piece by Suhas Palshikar in The Indian Express asks if he really wanted to show he’s a believer, couldn’t he visit places of worship of all religions, as his grandmother Indira might have done? Endorsing this, Nehru and Mahatma Gandhi’s biographer Ramachandra Guha wrote, “Rahul Gandhi’s amoral temple-hopping is an absolute betrayal of the best traditions of the party he claims to represent. Both Gandhi and Nehru would have been appalled by this shameless pandering to majoritarianism”. Writing in ThePrint, progressive editor and intellectual, Dilip Mandal, lists 30 privileges that he says Brahmins get by entitlement and tempted Rahul. The criticism gets shriller as you move sharper to the Left. Let me pick an argument with all of these. The central charge against Rahul is hypocrisy. Now when was hypocrisy a liability in politics? It is, on the other hand, an essential tool. Show me one politician who isn’t a hypocrite and I will show you a loser. Early on in my years of learning about Indian politics, I had once asked then Haryana chief minister Om Prakash Chautala if his and his family’s lifestyle, while claiming to speak for the poor farmer, wasn’t hypocrisy. He said, ‘bhai sahib, hum rajneeti karne aaye hain, ya teerthyatra pe (are we doing politics, or a pilgrimage)? This is a deeply religious country. In all large polls, including Pew and Gallup, more than 99 per cent Indians say they’re believers, leaving atheists a fraction even of our NOTA voters. There is no vote against the Gods here. Nehru got away with his agnosticism because it was still the afterglow of the freedom movement and he was after all, Nehru. His daughter was quick to rectify this, never shy of mandirs, sadhus, poojas and her rudraksh string. 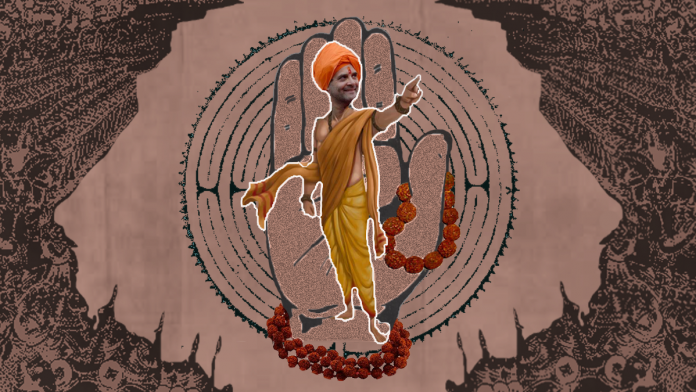 If Rahul wants to pick up the sacred thread where his daadi left it, especially when the BJP, which reduced his party to 44 in 2014, claims monopoly over Hinduism, it’s smart politics. Why cede your Gods to your rival? You can call it amoral, and you are welcome to find a truly moral politician, a maryada purushottam. I’m yet to meet one. Compromises would follow. Rahul’s Congress is guarded on triple talaq, blank on the Ram temple, one with the RSS on Sabarimala. Check its cow and cow urine-laden manifesto in Madhya Pradesh. Liberal disappointment with Rahul is understandable. But he cannot survive in politics with Nehruvian hard secularism. It won’t win him elections anywhere, not even in JNU, and he would end up the most illustrious loser in modern India’s history. Further, if he were to return fully to his grandmother’s way, he would look to deny the BJP monopoly over both, faith and nationalism. That culture, which includes religion and tradition, is where Congress and the UPA, under Sonia and her mostly Leftist NAC, lost their way. They began looking alien. India was no longer willing to accept that degree of clinical, near-agnostic secularism. One of the lines spoken in those years, by Manmohan Singh—minorities have the first right on their country’s resources— continues to haunt the Congress even now. UPA had vacated the Hindu-nationalist space fully for Modi’s BJP. Rahul’s shift probably fails the test of philosophical perfection, but it’s interesting politics, displaying an unfamiliar risk-taking ability. He has deliberately stepped on an unfamiliar pitch. There are many in the BJP/RSS who think they’ve got him just where they wanted. We had said earlier we would prefer another description for Rahul’s move. So here it is. This is like walking into a political chakravyuha. He can now win, or perish. He cannot retreat. And if he plays the ‘a-bit-of-this-and-a-bit-of-that’ game, he knows where that landed his father by 1989. The Indian masses are now not new to political as well as poll theatrics ! a blending of fiction, realism and some masaala ! and anti-public decisions as well as acts of NaMo led Union Government ! and BJP very adversely paving quite spontaneously way for the change ! Which section of society in India is not feeling unhappy, desperate and restless ? It is only Brahmanical hypocracy of Rahul Gandhi in Secular Democracy. A Brahmanical attire on body does not work in secular mind. It is an ill-political advise to a person of secular family who is fighting with surrealists in present politics. It would be better if Rahul Gandhi get married… is really help to Congress. If getting marriage or not is a personal matter then why does Rahul Gandhi make his Brahmanical attires as public thing in Congress. He should not involve religion into the politics of Congress. Someone must also play devil’s advocate. Rahul Gandhi’s temple-hopping is a satire on EVERY HINDU’s liturgical practices. All the saffron clad “baba”s, and all the Ganga-aarti doing politicians, and all the rest of them who carry weapons, revolvers etc, — ALL OF THEM are genuine, and genuinely dear to their gods except one man called Rahul Gandhi??? Sant Ravidas has said, “mun changa, toh katauti mein ganga” — what about that? Is this man committing a crime by starting to do only now what the others have been doing all their lives? Does telling a lie a thousand times makes it a truth? If you are a sham today, then you are a sham, but if you have been a sham all your life then you become a 24-carat genuine? Is God a toy that someone has “bought” from the market, and now owns? Mr Shekhar Gupta has now emerged as the Indian reincarnation of the evil Hitler & his deputies who demonised the Jews. His endorsement of the idiot Dilip Mandal’s (called senior journalist)) 30 privileges of Brahmins (29 of which are utterly false) is the biggest evidence that IE earlier under him and now the Print has emerged as the single biggest instigator of caste hatred (against only one community) deserving of only one place the jail. Beautiful analysis. I’m your great admirer sir, you simplify the matters to the core. Once a CPI worker asked the veteran CPI leader Late S A Dange, why the Left is unable to make a dent in North India, what’s the way out. Dange replied: “Ask our cadres to take ‘dhol’ ‘majira’ and do ‘satsang’ with the common people, our party will soon grow roots in the cow belt.” This suggestion was met with strong disapproval. It was treated as a wry joke. Years later, CPI leader Indrajit Gupta while speaking in LS after Operation Bluestar made this comment in his speech “Sir, this is after all India. You cannot tinker with religion. If you tinker with people’s religion, you shall be nowhere”. Shekhar Gupta’s article underlines this ‘culture’. In Britain, there is a shadow minister to follow each minister. Here we have a dozen ministers, led by the One who never smiles, to shadow the shadow Prime Minister. One statement by him, inconsequential man, although no longer a Pappu, and they are all over TV. On this one, I think Shri Rahul Gandhi is having fun. You were questioning whether I went to college, am a graduate, well, here it is : A post graduate degree from Harvard. A Hindu, a Brahmin, a Kashmiri Pandit, at that. This is an excerpt from another article: Since Lord Dattatreya was the son of one of the Sapt Rishis, he must have acquired his gotra from him, thus, his gotra must have been Atreya. Moreover, there is no such gotra or pravara for Hindus by the name of Dattatreya Gotra and thus, maybe, Mr. Gandhi had made a mistake in naming his gotra which has ultimately landed him in another controversy. The problem with either left wing or right wing is that they have never followed the basic principle of the constitution, that all citizens are to be treated equally. Even in Hindu religion, according to Bhagwat Gita, all people cannot be equal, each has his own talents and skills and personality, his dharma is decided by these factors (not by heredity or lineage) and as long as he follows his dharma (Gita never meant religiosity or tradition), he is a righteous person and he will receive God’s grace as befitting his actions. Even great people in the Mahabharata, who broke strayed away from their dharma, by falling prey to their own weaknesses such as Yudhistira, Dronacharya, Karna etc have suffered. But, as it is said, to err is human. Hence, the very popular notion of forgiveness in Christianity is present as redemption in Hinduism. If you do something wrong, there is no forgiveness and no escape from its consequences but you can always revert to your dharma and redeem yourself. Yudhistira got the chance and redeemed himself. Drona remained stubborn to the end and trained a son who was even more arrogant. Karna was given several chances but refused to redeem himself. Hope Rahul Gandhi understands this basic concept about Hinduism and reads Devdutt Patnaik books before indulging in something he does not understand. If he argues that because he is an upper tier Brahmin and thus, knows everything, then he is subscribing to a club that is a minority in India. 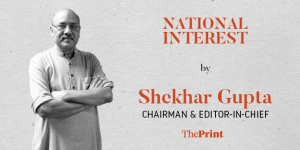 Shekhar, the crux of the matter is, who reduced the Congress to 44, Modi or Manmohan Singh? The answer is, Manmohan Singh. The second poser is, who will lead to the Congress’ resurrection, Rahul or Modi? The answer is, Modi. Rahul “s political drama analysed.